Make More Noise! Suffragettes in Silent Film, BFI 2015. Sunday November 1st at 1.30 p.m. 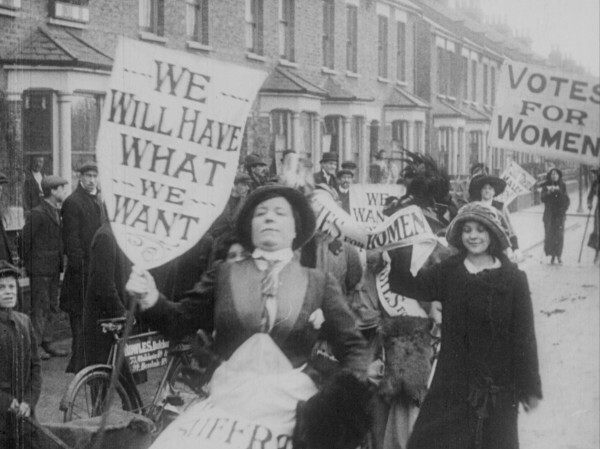 This is a compilation of early films about the early C20th British Suffragette Movement. The selected titles are relatively short and are predominately newsreel footage or equivalent. There is the famous action by Emily Davison at the 1913 Derby. There is also coverage of her funeral. This latter film was used behind the closing credits of the feature Suffragettes: though unfortunately in the increasing contemporary habit of re-sizing it into a widescreen frame. Film of an action in Trafalgar Square features Sylvia Pankhurst, inexplicably missing from Suffragette. The selection carries on into World War I when the Pankhurst’s and the movement split over whether to support the imperialist war or not. Sylvia Pankhurst was among those socialists who opposed the conflict. There are also some short fictional films, mainly in the comic mode. There are shorts that send up the movement and ridicule it. But there are also several films by Cecil Hepworth which take a less hostile view. Two of these feature a popular female character of the period, Tilly, a tomboy who was constantly getting involved in and surviving scrapes. This is a fascinating collection, transferred from the original 35mm films to a Digital Presentation. running for just on 75 minutes. The titles are organised chronologically and some of the later ones were quite likely screened at the Hyde Park. There is a musical accompaniment by Lilian Henley. I had the good fortune to hear her at London’s Cinema Museum and I am sure her accompaniment will set off these films really well. One final oddity, the BBFC have given the overall film a certificate of PG, but there was no reason displayed. Perhaps this is to protect younger male viewers? ← Horse Money, Portugal 2014.